a power full journey: NEW COACH SPECIAL! Check out this AMAZING deal!! CLICK HERE TO SIGN UP AS A COACH WITH THIS OFFER! This is AWESOME you guys! I sooo wish they had this when I signed up as a coach, I'd be all over it!!! If you have EVER thought about becoming a coach, or want Shakeology at a discounted price, you will be able to get the MOST INSANE discount that will save you $115. It is worth the programs ALONE!! They even make amazing holiday gifts!!! First of all, this combo comes with the three newest Beachbody programs: 21 Day Fix, P90X3, and Focus T25. Each one of these programs has a different approach and different focus. Each is 30 minutes a day or less and will help you reach your goals through your fitness journey. The 21 Day Fix will teach you how to prepare and portion healthy foods, setting the tone for diet and nutrition. The workout portion of 21 Day Fix gives you a variety of different workouts from cardio, strength training, pilates, and yoga. It also includes a modifier in each video. Or, if you’re ready, you can jump into either Focus T25 or P90X3 to get things really rolling. The best part is that you can use the 21 Day Fix diet approach with either of these other programs! And the New Coach Showcase Challenge Pack comes with Shakeology to give you the best results and that one super easy, convenient, delicious meal every single day. Not to mention it helps with building muscle, fat loss, and increasing energy. Shakeology is the most complete health product of it’s kind on the market. It is complete nutrition and fitness all in one package! That’s $496.75 in programs and shakes! 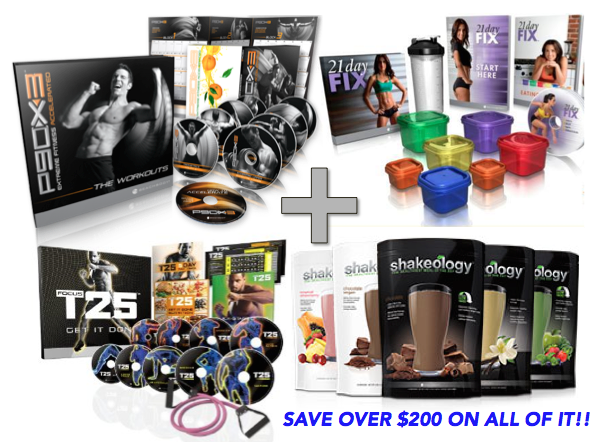 And any Shakeology follow on shipments would be $129.95 each! BUT with the Coach Showcase Challenge Pack will get you all this stuff for $295, a savings of over $200! And follow up Shakeology shipments would only be $98.00. THAT’S RIGHT, SAVE OVER $200!! * T25 + P90X3 + 21 Day Fix. YEP, you read that correctly! ALL 3 PROGRAMS!! * FREE spot in my EXCLUSIVE COACH TRAINING~ at YOUR pace. **Be part of a TOP TEAM! When you purchase this “Showcase Challenge Pack”, the $39.95 coach sign up fee is waived and you will receive 25% off of ALL of your Beachbody products and all of your purchases can be used as a tax deduction.